Nintendo has recorded full-year profits of ¥7 billion ($71.2m / £46.7m) for the financial year, half its estimated profits of ¥14bn. Sales were ¥635.4 billion ($6.3bn / £4.1bn) compared to targets of ¥670 billion, revised down by the company in January. The company suffered an operating loss of ¥36.4 billion ($364m / £239.5m). Although Nintendo has failed to hit estimated results, the company has managed to turn a profit compared to last year, where it recorded a huge loss of ¥43.2 billion ($433m / £284m). Nintendo blamed weak sales of the Wii U and 3DS consoles for the performance this year. In the last three months it only sold 390,000 Wii U units worldwide. Again, full-year hardware sales did not live up to company expectations, with the Wii U selling 3.45 million units instead of the projected 4 million, with software sales of 13.42 million units. Looking at software sales, Nintendo Land for Wii U sold 2.6 million units and New Super Mario Bros U 2.15 million. Lifetime-to-date sales of the 3DS are now 31.09 hardware units and 95.03 software units. It sold 13.95 million 3DS units during the financial year, below projections of 15 million. New Super Mario Bros. 2 for the 3DS sold 6.42 million units worldwide during the year, while combined packaged and digital sales of Animal Crossing: New Leaf hit over three million units in Japan. For the 2014 financial year Nintendo estimates it will sell 9 million Wii U units and 38 million games, along with 18 million 3DS consoles and 80 million games. Net profits are expected to be ¥55 billion with sales of ¥920 billion. Did the 3DS hit the revised hardware and software expectations? I'm sure Nintendo have a plan to turn things around, it's obvious that they do with 3DS; there's an enormous slate of software hitting in the next 9 months. The problem is they haven't communicated what their plan for Wii U is, and that is as about as good as not having a plan. I'm sure we'll hear more at their investor briefing, of course, but it's pretty obvious it's do or die for Iwata as CEO in this financial year. It's a real shame people are so blind into screaming at Nintendo for not enough first party games on the Wii U. Anyone with commen sense should understand how much complicated programming work goes into creating these first party games and that there are so many talented and extremely dedicated staff working on Nintendo's franchises. People should really stop moaning at hardware companies for not giving them a reason to buy their' system when it's blatantly obvious that these things don't grow on trees. I'm sure Nintendo can turn the tables at E3 this year around. I dont think its an unreasonable request to have a decent amount of games on a new console within the first 9 months. I have nothing to look forward to buying on it till the end of the year and if PS4 launches in Europe this year I will be busy playing on PS4. Since Jannuary I spent more time playing NES than playing on the Wii U. The console clearly needs more games, first party games and new third party games not re releases of games that are 1 year old. The 3DS software to hardware ration tell us owners only buy 3 games. That's absolutely pitiful. In the last three months it only sold 390,000 Wii U units worldwide. Thats pretty terrible. We all know why they've only managed that(not enough desired games) but the real question is what are they waiting for? E3 will most likely have some more reveals for the upcoming holiday season but they really need to start opening the software floodgates now, before the new Sony and Microsoft systems hit. If the summer months stay as dry as the past few months for software releases I expect Nintendo to continue struggling, especially in the face of two new competing next gen systems. But atleast the 3DS is still getting good games. @ Alex It's absolutely normal for a handheld this early in its life. That ratio raises throughout the lifetime of a console, and it's no worse than the DS's ratio was at this time. 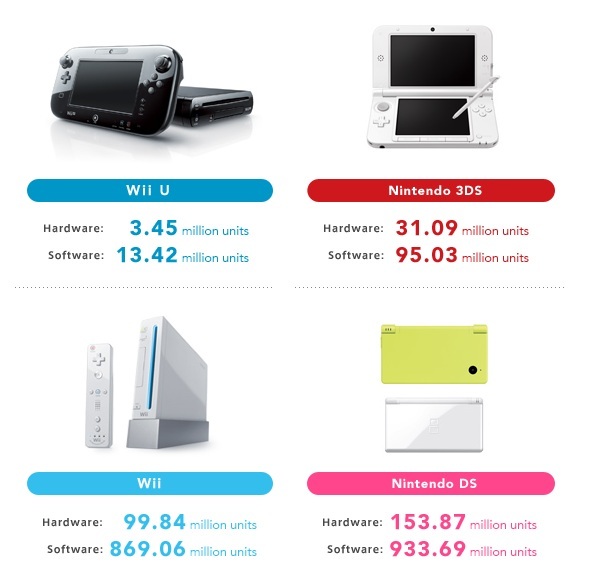 Just to further the point Nicholas is making, here are the software ratios for all of Nintendo's portables plus a few others. And remember, software attach ratios increase as a console ages.